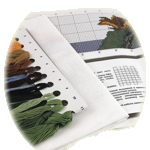 Providing today's crafter the finest in Cross Stitch Patterns, Kits and Supplies since 2006! Save Up to 50% on overstock and discontinued items while they last! 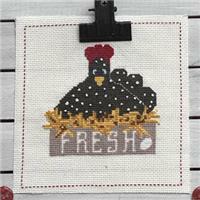 “Ewe” will love stitching this “stock” of cross stitch designs like no “udder”! 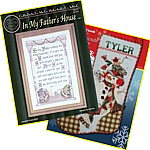 Save 15% on Farm Animal leaflets through April 29. 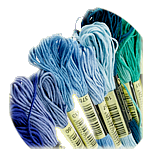 These bright and colorful kits will really put you in the mind for some great spring stitching! 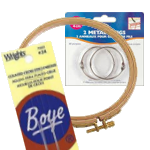 Save on RTO kits in April! Click Here to see the entire collection! Tonight as I was working on a witches face, (hard to do Halloween this time of year), anyway I got to a part and it was like what is this supposed to be. As I kept working, a thought came to me, doing count cross stitch is like doing a jigsaw puzzle, both can be overwhelming to start, however when you see the progress, it is such a feeling of accomplishment. 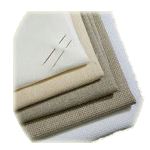 Jigsaw puzzles, one piece at a time, cross stitch one stitch at a time. With every piece or every stitch you near the end of a wonderful project. Another page finished on the Disney stained glass WIP! I’ve had a really rough week and want to thank you all for helping me get through it! I don’t post a lot but read all the posts daily and you all help me get through to the next day, so thanks for that :) I finished another page on my ginormous Disney project, by far best part of my week so thought I’d share. Next 2 pages are Winnie the Pooh, can’t wait to see how he comes to life! Today is the first time I have had a chance to sit down and catch up on Chat. My mother is in the hospital and I have been trying to get things done on their house in Oklahoma. They have a place here in S. Texas but it is 60 miles one way. Back in the day that was short mileage. Now it is very heavy traffic all the way pretty much. I spent yesterday evening just stitching on my HAED and enjoyed watching the cotton fields around me growing. Why are hospitals so dang cold? My mom and I had to ask for a blanket while waiting for her to be called in for Pre Opt. I was just reading on one of the posts that stitching is like meditation because you tune things out and focus on what is in front of you. It is so true. Hope everyone had a Happy Easter or Passover. If you are like me you are tired from all the weekend activity. Today I am just going to take it easy and work on my cross stitch project. I will watch some movies and also TV. With all of the rain we had will have to mow by next Saturday. Have a good day all! Hi Vcess. I recalled the beginning of that song and part of the end. OK, here it goes, "On top of spaghetti All covered with cheese I lost my poor meatball When somebody sneezed It fell on the floor And rolled out the door." I wish I could remember the rest. I t was a great song for singing at inappropriate times to irritate parents. Oops, I meant entertain. Thanks for bringing back the memory. board the game of thrones series. I have heard so much about it. The librarian was gracious enough to let me have the whole first season, which is 5 DVDs, for the Easter weekend. They generally only let you have 3 DVDs so I was very grateful even though I saw her roll her eyes and heard her comments about people, I mean come on it's a library and it's quite be grateful people even visit it anymore, I can hear you, plus it's your job. Anyway I have watched 3 episodes while cross stitching and I must say while it is interesting, it is well not what I was expecting in some areas, I can't go into detail but I can say it has its moments of beheadings and well moments of teaching women how to you know. Has anybody else watched this series? I don't want any specific details if you have. Hi Marsha cruisin 60 and clpatt. Are you all Americans? If so I am so impressed that you know that song. It is so Australian. We love our kookas and koalas and gum trees. Here is another bird which comes into my garden. A pair glorious King Parrots. What was your dumbest mistake as a newbie. Hi Bermuda - you are very observant. Yes that was a hibiscus but the grasshoppers loved it and I won't spray poison because of my birds, so it has gone and I've planted the garden with lots lavender pentas and many more shrubs. My garden is white lavender and pink No reds or oranges for me. Here is pic of same garden at Xmas. The large trees are Crepe Myrtle. We can't grow many blossom trees in Queensland so this is as close as I can get to having one. 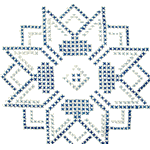 Visit the Everything Cross Stitch YouTube Channel! Checkout our YouTube Channel!